This review first appeared in October 2014 issue of high-end hifi magazine fairaudio.de of Germany. You can also read this review of La Rosita in its original German version. We publish its English translation in a mutual syndication arrangement with the publishers. As is customary for our own reviews, the writer's signature at review's end shows an e-mail address should you have questions or wish to send feedback. All images contained in this review are the property of fairaudio or La Rosita - Ed. An apple a day keeps the doctor away. According to Dan Bellity, head chef at French hifi house La Rosita in the south of France, one of PCfi’s advantages is that unlike with a CD player, error correction becomes unnecessary. That is, if actual CD rips first relied on the proper settings. It’s obviously not the exclusive insight of this affable Frenchman that a bit-correct data stream has the potential to sound better than one that’s been interpolated on the fly. Even so, it is one of the fundamental reasons why he’s dealt with the subject matter of streaming and D/A conversion for already 10 years now and in the process has cut out his own at times quite individualistic path. "Hey, it looks like a 20-year old CD player", I couldn’t help muttering as I stared at the La Rosita Alpha New streamer from behind. Disregarding the Ethernet port and strange black box to the right, all one gets are three RCAs – a pair for analogue out, one as coaxial digital out. I’d call that radical reductionism. It’s 2014 after all. Meanwhile this deck with onboard DAC gets away without a single one of today’s standard digital inputs. There's no coaxial or optical S/PDIF, no USB either for a computer, USB stick or outboard HHD. Okay, this is a network player, not a standalone DAC. But still. With a faint grin, Bellity acknowledged that such inputs might seem practical but also buy into two concrete issues: jitter and galvanic coupling whereby the latter creates potential ingress for computer-generated noise. Having gotten started, he nearly talked me out of the remaining digital input next, the LAN port. Whilst it works flawlessly, depending on network configuration this too can capture disturbances. Hence all of his decks are optimized for WiFi as the only solution which guarantees perfect galvanic isolation, hence the best sonics. That this thinking isn’t born of cheapness but a true foundation belief becomes evident when we consider that La Rosita’s flagship nearly €11’000 network player does it likewise. Aside from WLAN/LAN, it too omits all digital inputs. Hunters after top sound must sacrifice many trophy features. That’s of course a core mantra of classic high-end beliefs but here pops up unexpectedly with a digital source, not as a more intuitive lack of balance, bass, treble or loudness controls on an amplifier. About WLAN, the li’l black box sticking out the player’s rear assures perfect reception for the built-in Apple Airport card. To non-MACists, ‘Airport’ is Apple’s trademark for WiFi. Enter the second surprise. Why do our Southern Frenchies incorporate Cupertino tech? In theory, this wouldn't eliminate successful communications with a Windows computer or a non-MAC WLAN router. 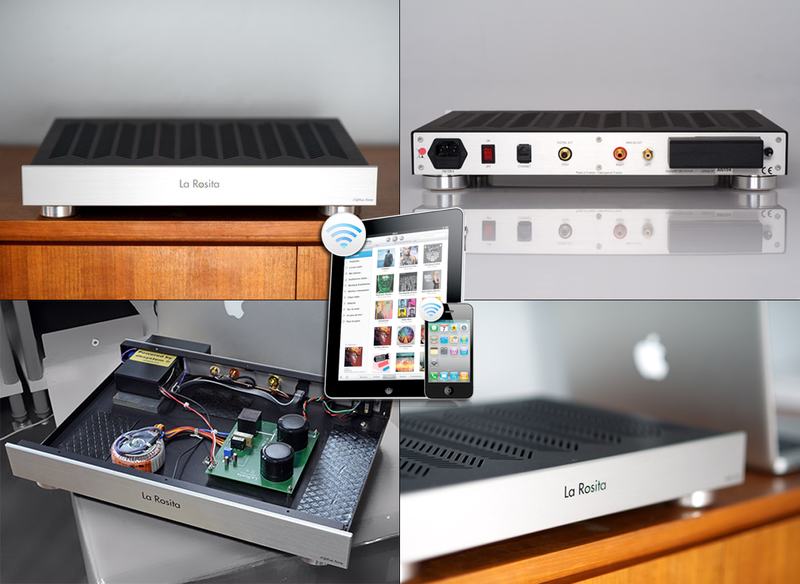 But one is limited to Airplay’s streaming protocol because in the end, the La Rosita is nothing but an Airplay receiver with a built-in high-quality converter. From this follows in triplicate that, 1/ all machines or media players which support the Airplay interface automatically with the Alpha, hence hello to all iTunes-running iDevices but also properly set-up Android smartphones or computers running JRiver or MediaMonkey players. 2/ To put it basic, this streamer doesn’t ‘grab’ data sitting on your home network but ‘receives’ them from your particular Airplay sender. 3/ And yes, this limits you to 16/44.1 CD resolution since the Airplay protocol is famously fixed at 48kHz. More about that anon. Why both maker and importer still recommend an Apple source, be it a MacBook Air or Pro, Mac mini or iMac, is due less to their hardware of Airplay module but more to the sending software of iTunes, or better, the now included, formerly a few hundred euro extra Rosita plug-in for iTunes which still is exclusive to Mac decks. This custom software controls the network connection at properly clocked high speed. It's a theme close to Bellity’s heart. One can obviously buffer data inside the streamer which he does but proper timing on the network’s send end remains vital regardless of any subsequent buffer. To illustrate the workings of his plug-in, there’s this small video.